Ukraine bailout money to the tune of $17.1 billion has been approved by the International Monetary Fund’s (IMF’s) Executive Board to help the country’s struggling economy. 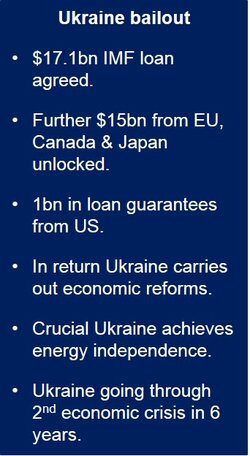 Ukraine announced a comprehensive program of economic reforms. The 24-member Executive Board that approved the loan included a Russian representative. The Ukraine bailout money, under a two-year Stand-By Arrangement, supports a program that aims to strengthen economic governance and transparency, promote sustainable growth, and restore macroeconomic stability. Ukraine will have immediate access to $3.2 billion, while the remainder will be subject to frequent reviews. According to Christine Lagarde, the IMF’s Managing Director, it will check regularly to make sure the Ukrainian government is following through on its commitments. IMF says it is impressed with Ukraine’s resolve. The IMF loan approval will now unlock further funds worth approximately $15 billion from donors, including the European Union, Canada, Japan and the World Bank, plus a further $1 billion in loan guarantees from the United States, which Congress recently approved. In a loan guarantee, an entity such as a government pledges to be liable for the debt in the event of a default. According to Moghadam, Ukraine is going through its second economic crisis in six years. An overvalued hryvnia (national currency) accompanied by very loose fiscal policy and sizable losses in Naftogaz (the state-owned gas company) led to large twin deficits, progressively rising indebtedness, recurring problems with external financing, and shrinking international reserves. Ukraine became especially vulnerable to political and economic shocks that eventually led to the current crisis. When the new government took office in February 2014, it rapidly took steps toward restoring financial and macroeconomic stability. “However, in addition to entrenching macroeconomic stability, Ukraine needs to undertake deep-reaching structural reforms to reduce imbalances, improve governance and the business climate– – Ukraine’s long-standing weaknesses– – and move toward balanced growth. An emphasis on capacity building is critically needed to address the legacy of ad hoc policy design and implementation,” Moghadam explained. Ukraine has embarked on a comprehensive and ambitions reform program aimed at addressing its macroeconomic imbalances and structural weaknesses. Maintain a flexible exchange rate – so that it may accumulate reserves and restore competitiveness, focus on domestic price stability, and concentrate on monetary policy. Going forward, the country commits to support competitiveness and match minimum wage rises with increases in productivity. The Ukrainian government has agreed to freeze the minimum wage. Achieve an energy sector that is self-sustained – and reduce the sector’s fiscal drain by getting rid of Naftogaz’s deficit by the end of 2018. The main target is to achieve energy independence. Slovakia and Ukraine agreed on the delivery of natural gas through an old pipeline, while Germany is supplying the country with gas via Poland, thus reducing the country’s dependence on supplies from Russia. Maintain confidence in the financial system – and improve the infrastructure for financial regulation and supervision. Make sure its banks strengthen their balance sheets as required. Implement comprehensive structural reforms – especially in areas of tax administration and public procurement, to help reduce corruption, improve the business environment, which will lead to strong and sustainable growth. In December 2013, Ukraine accepted a bailout from Russia worth $15 billion. However, after protests led to the ousting of pro-Russian President Viktor Yanukovych, the deal was cancelled. The IMF says that Russia has entered an economic recession, partly caused by the Ukrainian crisis and sanctions imposed by the EU, US and their allies. Investors are expected to move at least $100 billion out of the country in 2014.